Dental implants are titanium alloy pieces that are surgically placed in the jawbone to replace missing teeth. Implants replace the roots of missing teeth and support single crowns, large bridges, and dentures. 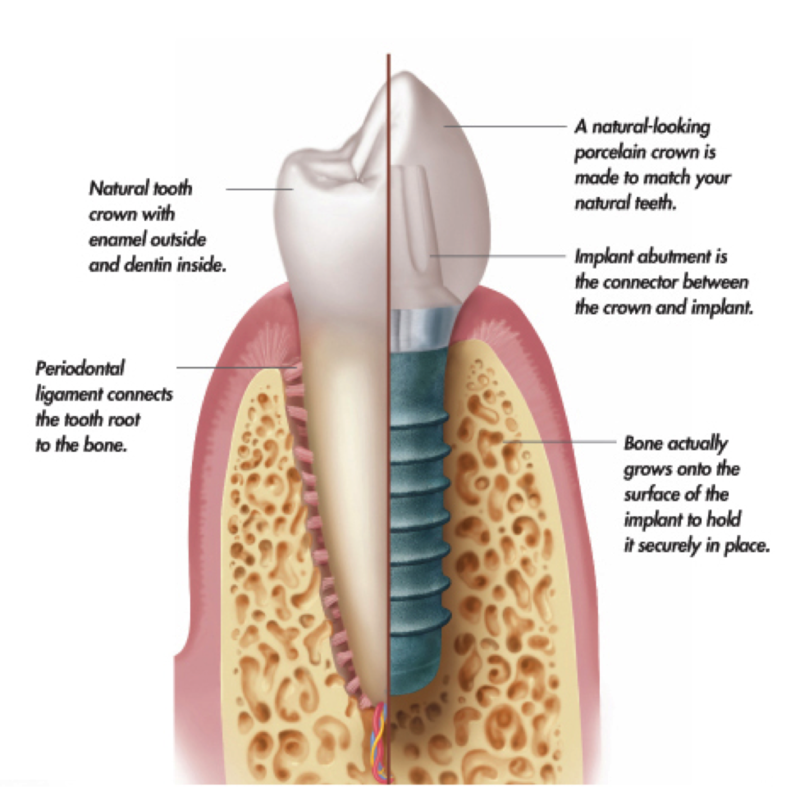 Think of dental implants as “screws” in the bone to hang prostheses (such as crowns, bridges or dentures). The modern and advanced technology makes these implant-supported artificial teeth to look, feel and function like natural teeth. Dr. Yum is specially trained and experienced in creating functional, natural-looking restorations. Depending on the dental condition, she can create the following restorations to affix to one or more dental implants. In cases where a single tooth is missing, or several teeth that are not adjacent, an implant can be placed into each empty tooth socket and attach a crown to it. If you are missing few in a row or all teeth in jaws, two or more implants can be placed to create an implant-supported bridge. They will most closely resemble the appearance of your natural teeth. Number of implants will be determined and strategically planned to replace missing teeth. Complete or Partial Dentures. Strategically-placed implants can be used to hold a full or partial denture in the mouth. Implant overdenture will utilize two to four implants in your upper or lower jaws and a denture made that snaps onto these implants. This option allows your upper or lower denture to be more stable while chewing than without implants. It is also possible to eliminate the coverage on your roof of mouth depending on number of implants. However, this prosthesis will still have movement of your denture and can cause sore spots. Yet, it will be still removable for each cleaning. Five or more implants in your jaw can attach a fixed denture. This prosthesis doesn’t touch the gum, and specialized brushes and tools will allow the easy cleaning. At maintenance visit, the prosthesis will be removed for professional cleaning. Currently, there are many different types of dental implants and implant supported prosthesis on the market. It is important to determine replacement options with a meticulous evaluation and planning. These options may also be limited by the current condition and density of your jawbone. Dr. Yum can review how implant-supported prosthesis can improve quality of your life, esthetics, and oral health and function. Please call Dr. Yum at (610) 770-0210 for a consultation.